04 FebHow can the Chinese New Year Affect Your Business? During Chinese New Year (CNY), the Chinese in mainland China tend to have a celebration that lasts for about 20 days. Business simply stops in China. A blackout, literally. Students enjoy a 1-month winter holiday, while working adults get 7 days off from work. Business is usually resumed on the 8th day of the festival, as ‘8’ is known as an auspicious number in the Chinese culture. For B2B organizations, it means a decrease in sales figure because most people take the day off to be with their families. The festive spreads far outside mainland China, to Singapore, which has majority of Chinese populations. The celebration in Singapore stretches over 15 days with the first 2 days declared as Public Holidays. Big businesses begin operations from the 3rd day but many Chinese-owned businesses will likely to be closed longer as this is their only break for the year. Read more to find out how Chinese New Year affect your business. The Singapore Exchange observes holiday on the first 2 days of CNY. During CNY, it is a tradition to gift-giving in the form of ‘red packets’ to the younger generation. Many believed that giving money during CNY brings luck to both the giver and the receiver. Cash withdrawal is especially popular during this period of time. People starts withdrawing new notes out of the ATMs to give red packets. With the stock market closed and people drawing cash out of the bank systems, this causes fluctuations in stocks. As a result, stock markets tend to experience notable drop in volumes 1-2 weeks before market closure and recovers after reopening. Foreign investors also wind down trading in Asia as CNY nears. All banks are closed, and no payment can be processed during the week of CNY. The three main banks in Singapore: DBS, OCBC and UOB will be closed on the first two days of CNY as well. Therefore, company’s payment process and cash flow payment will be lagged; this may cause a negative impact on your business especially if you have Chinese partners. Most businesses, offices and shops also close on the first two days of CNY. Many places, including the central business district areas will look like ghost town with so few people on street. Even Muslim majority Malaysia and Indonesia, with large Chinese minorities, take holidays too. If you have payments to settle with investors or customers during the February period, do try to arrange forward as many are bound to take short breaks during that festive period. Chinese New Year affect Your business in various ways, no payments can be processed in most countries, including Singapore. Often, one of the most suitable course of action is to settle all payments before CNY. This is to avoid any potential problems with late payment fees. Strategic planning, coupled with efficient communications with investors and customers will go a long way to ensuring that negative effects on cash flow are minimized as much as possible. 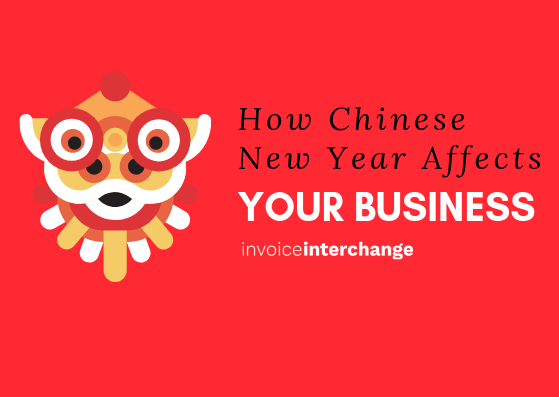 In any case, if you need to unlock cash flow to support your operations during Chinese New Year, Invoice Financing is one of the tool that can support this by selling outstanding invoices to Financier. Cash can be in your account within 24 hours with InvoiceInterchange.